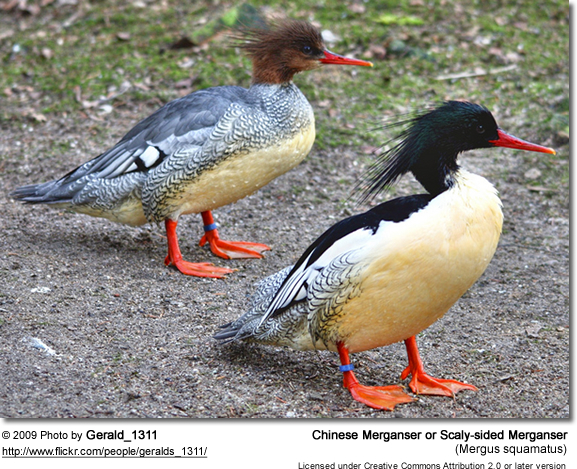 The Chinese Merganser or Scaly-sided Merganser (Mergus squamatus) is an endangered typical merganser (genus Mergus). It lives in temperate East Asia, breeding in the north and wintering in the south. It is a striking sea duck with a thin red bill and a scaled dark pattern on the flanks and rump. Both sexes have a crest of wispy elongated feathers, reaching almost to the shoulders in adult males and being fairly short in females and immatures. The adult male has a black head and neck, white breast and underparts, and blackish mantle and wings, except for the white innerwings. The scaling is also black, while the tail is medium grey. The female has a buffish head and otherwise replaces the males' black with grey colour. The legs are orange-red and the irides dark brown in both sexes. Their breeding habitat is rivers in primary forest in the southeastern Russian Far East, perhaps in North Korea, and in northeastern China. The bulk of the species' population seems to breed in the Xiao Xingangling Mountains (Heilongjiang Province) and Changbai Mountains of China. M. squamatus are migratory, wintering in central and southern China, with small numbers in Japan, South Korea, Taiwan, northern Vietnam, Myanmar and Thailand. They arrive on the breeding grounds as soon as winter is over, in March, and leave when the first cold nights come in late October. It is a shy and easily startled bird which favors mid-sized rivers which meander through wide expanses of mixed forest in the lowlands, up to 1,000 meters ASL or less. Birds thend to move upriver during the day, both when startled and when foraging; the is latter probably because stirred-up sediments will alert and hide prey downstream. Food is caught with the serrated beak from between the riverbed gravel; often the birds dive for prey, repeatedly submerging for a quarter- to half-minute with only a few seconds' pause between dives. In shallow water, the birds submerge only the head; they do not upend. The birds are not very social, and only rarely encountered in groups larger than pairs or families. Even on the wintering grounds, groups of more than a dozen are very rare. They spend most of the daylight time foraging, except around noon when they take some time to rest, preen and socialize at the river banks, where they also sleep. The food of M. squamatus consists of aquatic arthropods and small or young fish. Stonefly (Plecoptera) and Phryganeidae giant caddisfly larvae may constitute the bulk of its diet when available. Beetles and crustaceans are eaten less regularly, though the latter may be more important in autumn. As aquatic insect larvae hatch in the course of the summer, fish become more prominent in the diet. Favorite fish species include the Dojo Loach (Misgurnus anguillicaudatus) and the lenok Brachymystax lenok. More rarely eaten are such species as the lamprey Eudontomyzon morii, the sculpin Mesocottus haitej, or the Arctic Grayling (Thymallus arcticus). Thus, they are opportunistic feeders; regarding fish, they will probably eat any species that has the correct elongated shape and small size. 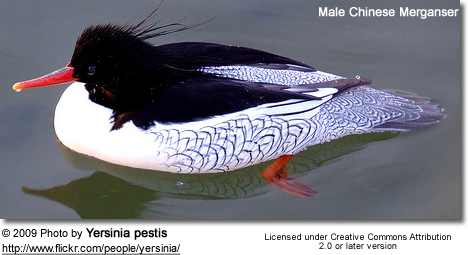 Scaly-sided Mergansers nest in trees, as typical for the merganser and goldeneye lineage of sea ducks. Preferred nesting trees are such species as Daimyo Oak (Quercus dentata, Chinese: 柞栎 and Ussuri Poplar (Populus ussuriensis, 大青杨; a balsam poplar). They are sympatric with Mandarin Ducks (Aix galericulata); though both relish the same insect larvae, they do not seem to compete for food, but perhaps for nesting holes (which neither can excavate themselves). In its winter quarters, the Scaly-sided Merganser might compete with other Merginae with which it shares its habitat then, e.g. Common Mergansers (M. merganser) and Common Goldeneyes (Bucephala clangula). This species is considered endangered by the IUCN. Its numbers declined in the 1960s and 1970s due to loss of primary forests in its limited range, particularly along the major rivers. Current threats include illegal hunting, entanglement in fishing nets and river pollution, as well as ongoing destruction of forest. According to its current IUCN classification EN C2a(ii), less than 2500 adult birds remain, and most of these are found in the region where the borders of China, North Korea and Russia meet. 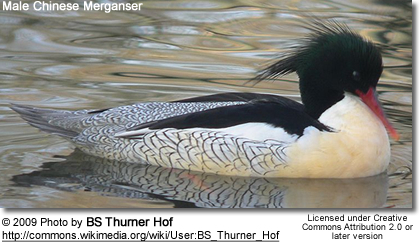 A confounding factor is that the Scaly-sided Merganser is rather solitary and extremely shy and alert. Thus, even though its range is still quite extensive, an accurate estimate of its population is difficult. 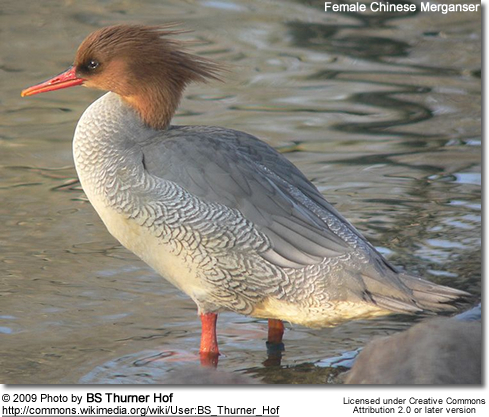 A somewhat crude but nonetheless important indication of the Scaly-sided Merganser's population status may be gleaned by annual censuses on the lower Yangtze River, which constitutes the single most important wintering area known to date. The mid-2000s assumption of a 20% or more decline in numbers til 2010 is discarded at present, because though the decline is certainly ongoing there is still too little data to quantify it that accurately. Copyright: Wikipedia. This article is licensed under the GNU Free Documentation License. It uses material from Wikipedia.org.